Materials that gracefully show wearpine floors, mahogany countersare key to a Los Angeles design team's aesthetic. We've all been programmed to strive for perfection when it comes to creating kitchens," says L.A. architect Steve Giannetti (giannettiarchitects.com). "But kitchens aren't for performing surgerythey don't have to be perfect and antiseptic." Giannetti and his wife, Brooke, an interior designer, ignore convention and go for a more natural, time-worn look in the kitchen. They purposefully use materials that change with age, like Calcutta marble walls, mahogany countertops and pine floorsdespite the protests of clients who fear dents, scratches and cracks. Steve reassures them: "We even have a wood floor outside our shower, and it's perfectly fine." Here, the Giannettis explain how they use design elements to give kitchens a lived-in feel. "If you wrap your sofa in plastic, it's going to be perfect," Steve says. "But who wants to live like that?" The Giannettis always choose surface-mounted ceiling lights. "The effect is much warmer," says Brooke. For a client's house in L.A. (above, right), the duo illuminate the prep island with a pair of metal Hudson Valley Pelham pendants ($850 each; 1800lighting.com) and use Kellogg fixtures ($85) with hexagonal glass shades ($28) for the rest of the space. rejuvenation.com. The prep island has a mahogany counter; the rest of the countertops are granite, as is the sink. 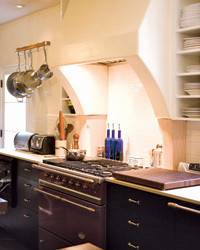 The cabinets on either side of the stove hood have glass doors in front and windows in the back. 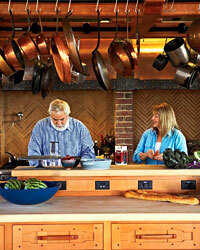 "It's a way to add more light in the kitchen without giving up storage," says Steve. The Giannettis like to mix antique pieces with industrial ones, like stainless steel chairs from a medical supply store ($450; medplususa.com). "Corners are such a dead space," Steve says. So for their own kitchen, the Giannettis created corner cabinets with extra depth to hide appliances, like a microwave and toaster. 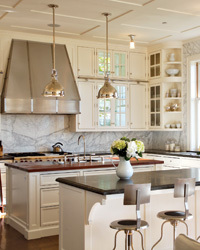 A Victorian-inspired pressed-tin ceiling is painted white. "It's so easy to install," Steve says. From $2 per sq ft; thetinman.com. Instead of storing bottles of wine, the Giannettis' GE Monogram undercounter fridge holds kids' lunches and leftovers. $1,600; ge.com. "We chop and otherwise prep ingredients directly on the kitchen island's maple-wood top and let the finish wear off," says Steve. "We really like the way the surface looks as it has aged." The Giannettis prefer a big, single-basin sink like this Rohl Shaw fireclay model, which has been produced in England since the 1890s ($900; rohlhome.com). "I don't understand double sinks. Neither side is ever big enough," Steve says. The linen skirt under the sink and the decorative molding add a retro feel.